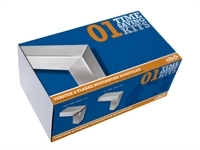 TSK01 Time Saving Kit: For Brush Finishing External Stainless Flat. Kit TSK01 allows the user to satin finish stainless steel flat surfaces from a TIG welded joint and create brush finished mitre corners. The kit contains all the abrasive components needed. All you need otherwise is a suitable metal polishing machine or slow speed grinder, size 125mm. Links to videos online so you can see the abrasives in use brush finishing mitres. All abrasive products required to complete the task, plus specialist backing pads and Inoxitape. This kit is most usually used with the Finipower machine.